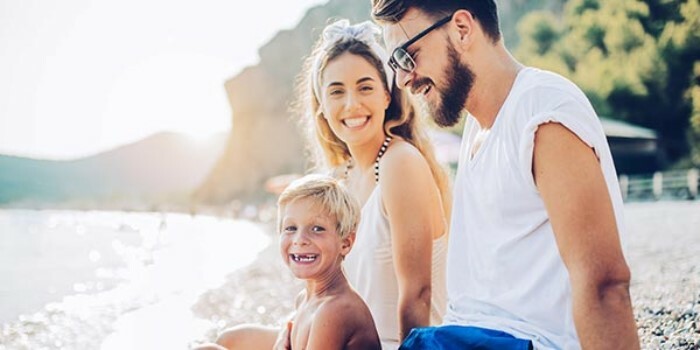 Between long hours at work, and trying to keep the kids busy with activities, it's not hard to see how finding the time to book a vacation could feel like a luxury we do not have. Fear not though! There's still plenty of time left. So, if you want to make that European vacation a reality, here's five of the family friendliest places our travel experts agree should be at the top of your list. When we think of beach holidays in Europe, images of Spain, Italy, or Portugal usually pop into our minds. However, Gjerrild Nordstrand on the Djursland peninsula in Denmake is an absolutely beautiful and calm beach side escape for adults and kids alike. With picture perfect white sands and shallow waters, Gjerrild Nordstrand is a child-friendly destination that's both perfect for swimming and tanning. Take up residence at one of the many campsites, all of which offer a combination of playgrounds, trampolines, mini golf, plus fancy heated adult and kids swimming pools. Denmark, here we come! The most visited theme park in Europe, since 1992 Europeans have been enjoying Disneyland Paris for a very good reason - it's that "happiest place on earth". Divided into five theme lands with a total of 49 attractions, it's not hard to see why Disneyland Paris is fun for all ages. Keep an eye out for 2-for-1 ticket deals, as well as hotel and park packages for the ultimate in savings. When it comes to relaxing escapes and serene beauty, there are few places dreamier than Somerset in South West England. With its rolling hills and stunning countryside, Somerset is the epitome of rural English beauty. Take the family to the spectacular Secret Valley farm. Let the kids pet animals, or play at the Black Rock Outdoor activity centre, while the adults get to enjoy wine tasting from Secret Valley's own private vineyard. Who can say no to wine? Scandinavia's biggest amusement park Liseberg Amusement Park in Gothenburg, Sweden is for thrill-seekers of all ages. Attracting nearly three million visitors annually, Liseberg has something for everyone with 42 rides and attractions. Home to the world-famous wooden coaster Balder, other highlights include Europe's longest dive coaster the Valkyria, and Scandinavia's fastest roller coaster, HELIX. Meanwhile, your little ones will absolutely love Barnens Paradis. In addition to its otherworldly landscapes and beautiful beaches, the Unesco biosphere reserve that is Lanzarote (one of the Canary Islands off the coast of West Africa) is also a great destination for kids! When it comes to unique experiences, Lanzarote offers two incredible opportunities. Walk the surface of the moon at Timanfaya National Park, and see breathtaking views by the surreal volcanic landscapes. Or explore the depths of the Atlantic Ocean with a submarine safari, which takes visitors 30 meters (100 feet) below the ocean for an aquatic adventure. Other popular activities include Aqualava and Aquapark waterparks, and the Rancho Texas Lanzarote Park zoo where visitors can swim with sea lions, or watch animals perform hilarious shows. So, where in Europe will your family escape this time?